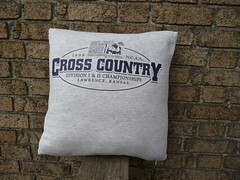 So I've completed another sweatshirt turned into pillow project. This was Ben's favorite cross-country sweatshirt from high school. The collar and the sleeves were showing a lot of wear. Ben decided it was time to retire it so he asked me if I'd make it into a pillow like I did with Katie's. I've had it for a long time now. Way longer than needed even for the average procrastinator to take to get around to it. On this one I used an invisible zipper. It looks good, but I did have some trouble getting too close to the zip when sewing it and accidentally sewed across some teeth causing it not to zip properly. I ripped it back and did it over. It looks good and works great now.